After a bit of math and an adjustment in the thickness of the arches, however, Franks’ crews preserved the proper scale and proportion. Especially problematic was the half arch connecting the free-standing structure to the back of the house – since a gutter had to be added for sufficient drainage. 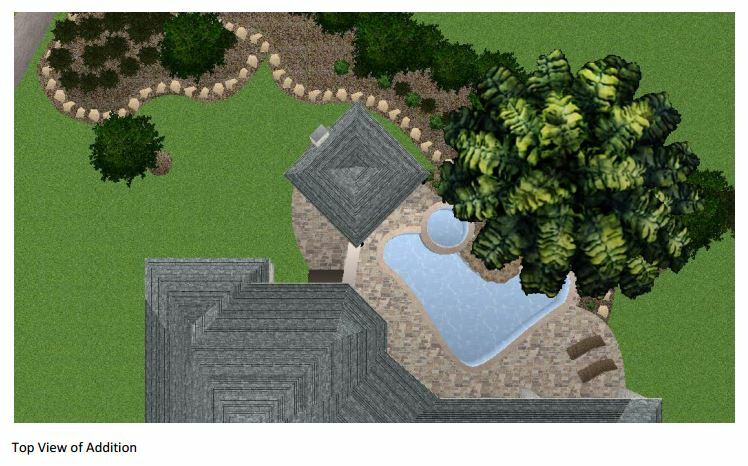 Built at an angle that faces the back of the house at the far end of the pool and hot tub (see early construction photo and aerial view, below), this outdoor living space design definitely fulfills its mission to blend in with the existing house. 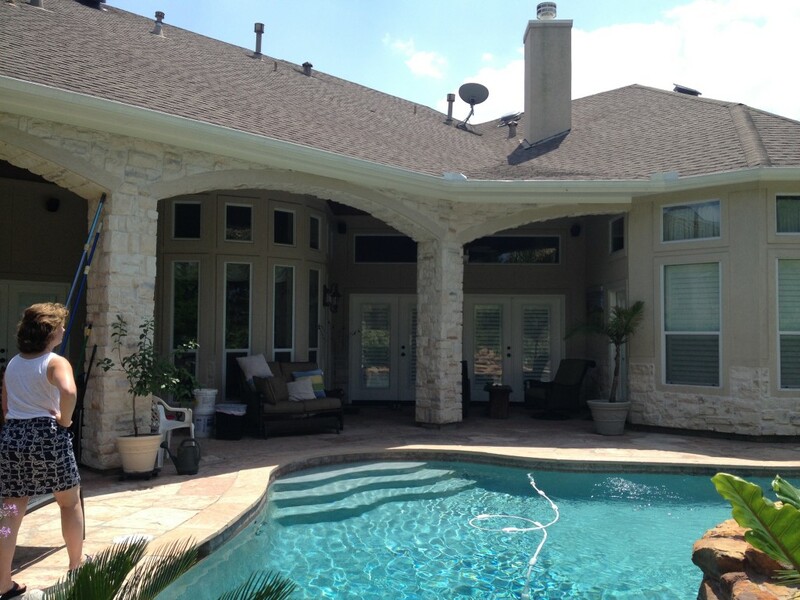 Its light-colored stucco and Western Austin Limestone with bluish-grey accents, for instance, echoes the contemporary home’s stone and stucco exterior. 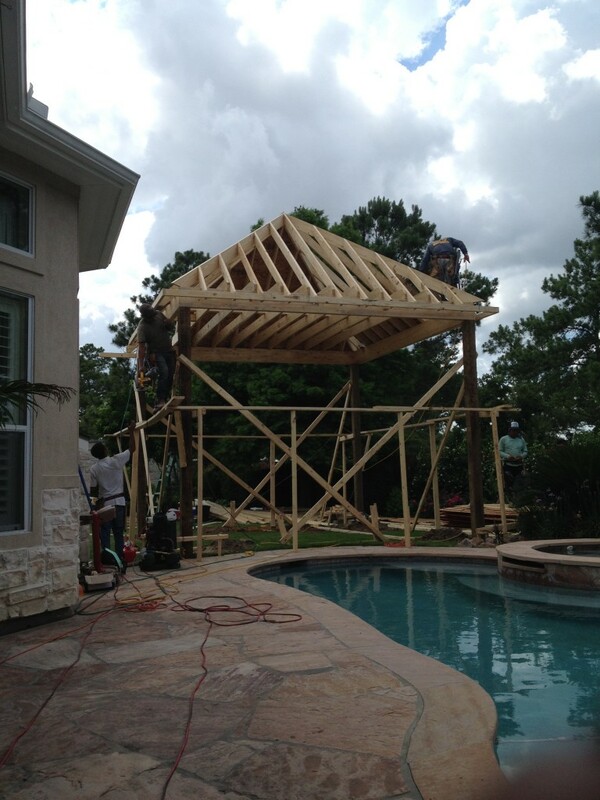 The 10-foot-high ceiling under the hipped roof, meanwhile, features a dark stain matching that of the existing covered patio ceiling along the back of the house. 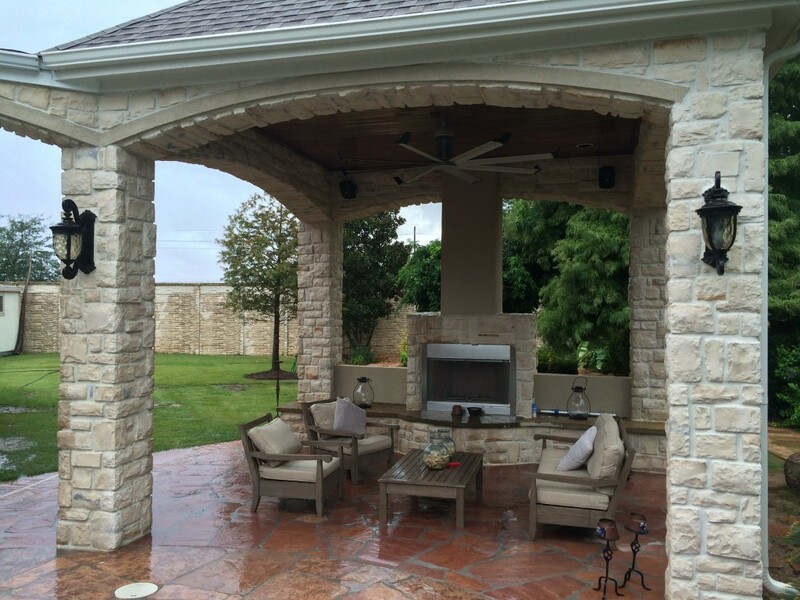 The addition’s Rosa flagstone patio is also an extension of the existing patio, and the Oklahoma wister flagstone bench seating is a perfect match to the coping on the existing pool. Similarly, the black lantern light fixtures on the support columns of this outdoor sitting area are the same style as those on the house. The Restoration Hardware seating and coffee table, meanwhile, will suit the client’s desire to entertain guests in style after dinner while enjoying a cigar. Question: A dining table for six was originally planned for this space instead of a seating area. Which would you prefer – a dining table or seating area? Post a comment and tell us why! Either way, if you’re interested in outdoor furniture for your outdoor sitting area, we’re offering a special limited-time promotion: $500 off an outdoor furniture consultation when Outdoor Homescapes of Houston designs and builds your outdoor living space! 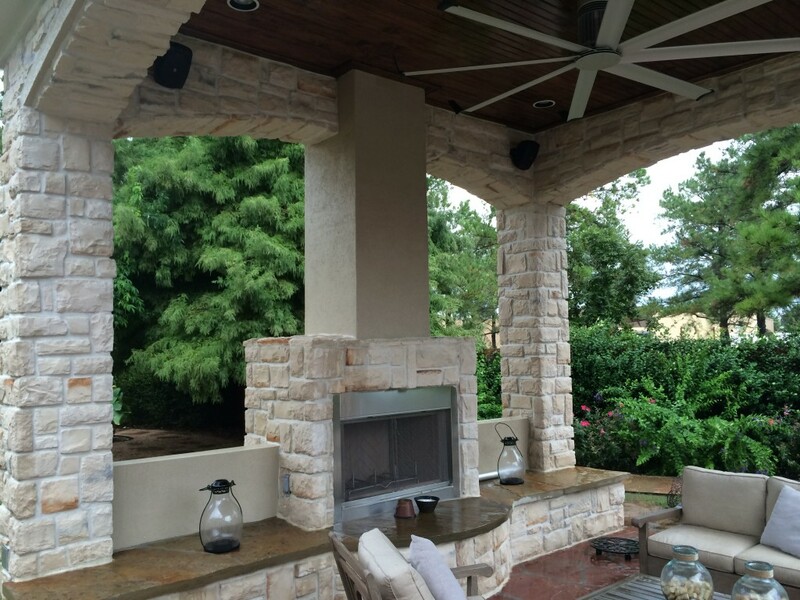 Or feel free to check out our pictures of other Houston outdoor sitting area designs on Houzz!